California, USA "Today is the day of ..." "Gandhi is a great man"
California, USA, will establish and declare 'Day of Fort San Jungho' on 9th local time. On November 9th this year, the 140th anniversary of the birth of Dr. Chang-Ho Ahn in Dosan is declaring the anniversary in line with the birthday of the father. California, USA, will establish and declare 'Day of Fort San Jungho' on 9th local time. On November 9, this year, the 140th anniversary of Dr. Tae-san Ahn Chang-ho (1878-1938) was declared anniversary in line with the birthday. In California, it is very rare to enact an anniversary celebrating a foreign national person who is not a US national. The presidential election of Changsan Ilbo was followed by a series of resolutions passed in August by the California legislature. 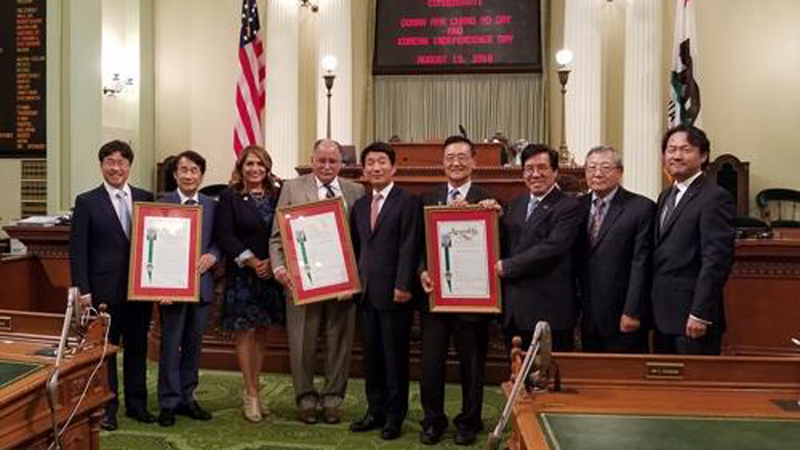 The House of Representatives voted unanimously in August to jointly launch a joint resolution, Dosan Ahn Chang Ho Day, by Rep. Choi Seok Ho, Jim Patterson, Jose Medina, and Sharon Quirk Silva. . The Legislature also approved the resolution at the same month of the month with overwhelming support of 39, 0, 1. The Memorial Foundation of the Americas, the Memorial Foundation of the Korean People's Congress, and the American Heavy Industries Committee will hold a ceremony for the establishment of the 'Dosan An Changho Day' at the Los Angeles Downtown Hotel Line on the afternoon of the 9th. At the ceremony, a lecture will be held comparing Dr. Tosan Ahn with Mahatma Gandhi, a local presence in India, and Martin Luther King, the symbol of the American civil rights movement. The Korean American community hopes that it will be an opportunity to spread the common good that Doksan, Gandhi, and King devote to universal human rights, national independence and self - respect to the 2nd generation Korean and the 3rd generation. "In the past, the California legislature passed a resolution to enact a day of Ahn Chang-ho in the province of Doosan, saying," Doksan is accepted as one of the most important patriotic branches for Koreans both at home and abroad. "He was born in 1878, "He explained. After that, Mr. Dosan has been dreaming about modern education of his country by going to Mission School in Seoul since his teenage years. In 1902, he went to San Francisco and introduced the fact that early Korean immigrants settled in the Americas. It also highlighted the path that the leadership of Dosan played a major role in the successful settlement of the American community, especially the Korean American community in California. The consulate general of LA said, "The enactment of Ahn Chang-ho's day in Doosan is a celebration of the achievements of foreigners, not of American nationality. It is very meaningful in history. It is a great opportunity to raise the status of Korean American community. I was recognized as an immigrant social leader and social activist. " Ahn Chang-ho resides in the United States for over 10 years. Dosan went down from San Francisco in 1904 and settled in Riverside, a small town east of Los Angeles, California, where he built the first Korean community, Pacha Camp. The following year, we established the Public Association, the 1906 New People's Congress, and the 1909 Korean People's Congress. In 1913, California was the cornerstone of the founding of the company. There are interchange signs attached to the name of Dr. Chang-Ho Ahn in Dosan in the LA highway section of California, and there are monuments such as Dosan statue, Dosan An Chang-ho post office, and Dosan-Changho plaza. Dosan An Chang Ho Post Office will be moved soon according to the residential building development plan, but the name can be kept as it is.